Each offseason, MiLB.com goes position by position across each system and honors the players -- regardless of age or prospect status -- who had the best seasons in their organization.Click here to locate your favorite club. The Pirates' decision to be buyers at the 2018 trade deadline cost them a hefty price in prospects. Larry Broadway, Pittsburgh's director of player development, understood the cost of acquiring controllable Major League talent, saying, "You had to give some to get some," and the organization parted with a highly regarded group in Austin Meadows, Taylor Hearn, Tyler Glasnow, Shane Baz. When the dust settled, the Bucs retained an impressive group of infield prospects that will likely provide a fun competition for Major League playing time. The Pirates have depth at shortstop, in particular, which Broadway insists is a great starting point. "Coming up as legitimate shortstops opens up a whole bunch of versatility when they get closer to the big leagues, and different organizational needs come into play," he said. "I'm very happy about having that type of competition and ceiling at that position." Healthy competition is how fourth-ranked Oneil Cruz, a 6-foot-6 shortstop, gets left off of these types of lists despite batting .286/.343/.488 with 46 extra-base hits and 59 RBIs. It took two incredible performances to outshine that type of season, and the Pirates had exactly that in 2018. Catcher -- Deon Stafford, Class A West Virginia (94 games): The 2017 fifth-rounder from nearby Harrisburg, Pennsylvania, was entrusted with the heaviest workload among the organization's catchers with 81 contests behind the plate. Stafford was bat-first coming out of the Draft and produced adequate offensive numbers in 2018, batting .253 with a .749 OPS, 11 home runs and 49 RBIs. Broadway noted a marked improvement in the team's No. 29 prospect on defense and in working with a West Virginia pitching staff that compiled a 3.40 team ERA, fourth-best in the South Atlantic League. Stafford threw out 24 of 90 attempted base stealers and committed 12 errors behind the plate. First baseman -- Will Craig, Double-A Altoona (132 games): From the top to the bottom of the organizational ladder, only Gregory Polanco (23) hit more home runs than Craig (20) this season, and nobody in the organization bested the No. 16 prospect's 102 RBIs. The 24-year-old more than tripled his 2017 homer total and drove in 51 more runs in just 22 more at-bats. "Anytime you can drive in 100 runs and hit 20 homers, you're doing something pretty special," Broadway said. "He showed the ability to hit some advanced level pitching, to be able to drive in runs, not just with the long ball but the ability to hit with runners on base and to have a good approach with runners in scoring position." Craig batted .248 with a .768 OPS and 30 doubles, hitting at a .270 clip with 87 RBIs when coming to the plate with runners in scoring position. The 22nd overall pick in 2016 was also an incredibly consistent hitter, batting .248 both before and after the All-Star break and seeing only a nine point difference in his average against righties (.250) and lefties (.241). Originally drafted as a third baseman, he's played first base exclusively over the past two seasons and made eight errors this year. Second baseman -- Kevin Kramer, Pittsburgh (21 games), Triple-A Indianapolis (129 games): Kramer, along with Kevin Newman, was part of one of the best middle infield duos in the Minors at Indianapolis, leading to his first call to the Majors in September. He struggled in Pittsburgh but more than earned the promotion after batting .311/.365/.492 with 15 homers, 35 doubles, three triples and 59 RBIs. "The production at second base was very good offensively. ... He continued to build on a really strong season last year," Broadway said. "To be able to go up there, first year in Triple-A, and be a consistent threat in the middle of the lineup, really the power numbers are what stood out a lot." The club's No. 7 prospect had 10 total homers over the past three years, including six during an injury-riddled 2017 season in which he was limited to 57 games. He also stole 15 bases and played three different positions in the infield, with the bulk of his workload coming with 82 games at second. 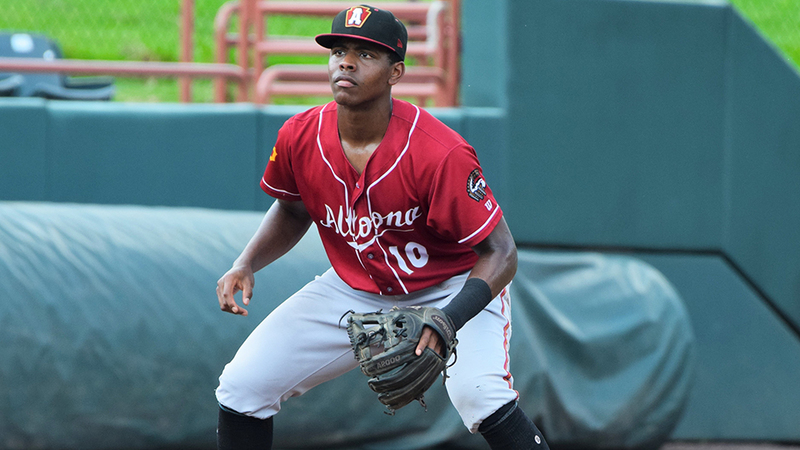 Third baseman -- Ke'Bryan Hayes, Altoona (117 games): The son of former Major Leaguer Charlie Hayes and Pirates' first-round pick in 2015 was named the organization's Minor League Player of the Year after his debut season in the Eastern League -- ane that included his second consecutive Gold Glove, a Futures Game appearance and midseason and postseason All-Star honors. "I think we're looking at him long term to be the anchor in our infield and our lineup in Pittsburgh at some point," Broadway said. The No. 48 overall prospect batted .293/.375/.444 with seven homers, seven triples, 31 doubles and 12 stolen bases -- all of which were career highs. "You look at just the power numbers starting to trend up. The quality at-bats start to trend up, and physically he's getting stronger and you're seeing the production continue to climb," Broadway said. "He was a threat every time up and probably the most consistent at-bat that we had all year." Hayes committed only six errors and led all Minor League third basemen with a .978 fielding percentage. "[His defense] stands out when you're watching that many games," Broadway said. "He can just read hops and create good hops, and he's just really slick working over there." Shortstop -- Cole Tucker, Altoona (133 games): The 22-year-old led all Pirates Minor Leaguers with 77 runs scored and was tops in the organization with 35 stolen bases, a total that decreased form his career-best 47 steals in 2017. He batted .259/.333/.356 with five homers, seven triples, 21 doubles and 44 RBIs in his first full season at Double-A. He was a better hitter with runners on base (.289) than with the bases empty (.245), and hit at the top of the order in all but one game this season. "He's a big, long lanky, athletic kid. ... He's just now starting to control those long levers better and they're going to sync up better, and you just see it in the quality of his at-bats," Broadway said. "I think [he's] just a complete player. ... He just continues to grow and take the challenges as they come, and he's never really phased by anything. "He's been really fun to watch grow." The 6-foot-3, 205-pounder has played exclusively at shortstop throughout his career, made 14 errors this season and is likely to stick at the position. Broadway said Tucker's speed helps him cover a lot of ground, and that his arm strength was noticeably better this season. Tucker earned an invitation to the Arizona Fall League and batted .370 with an .899 OPS, six stolen bases and 18 runs scored. Utility player -- Kevin Newman, Pittsburgh (31 games), Indianapolis (109 games): Newman followed Kramer from the International League to the Pirates in September following a consistent season on both sides of the ball. The club's No. 6 prospect wasn't boring in his consistency, either, taking part in one of two Minor League "bi-cycles" this year with Jacob Stallings on Aug. 8. He batted .302 with a .758 OPS, 30 doubles and 74 runs scored and was one of six Pirates Minor Leaguers with at least 20 stolen bases -- swiping 28 bags, third-best in the organization. The 25-year-old played 83 games at shortstop and 21 at second, garnering playing time at both positions during his stint Majors. Jason Martin, Indianapolis (59 games), Altoona (68 games): Acquired as one of the four pieces in the return for Gerrit Cole, Martin was fantastic to open the season in Double-A, hitting .325 with a .913 OPS, but struggled to produce at the next level. The club's No. 13 prospect batted .211/.270/.319 with 12 extra-base hits and 21 RBIs, striking out in nearly a quarter of his at-bats at Triple-A. "There's definitely some power in him," Broadway said. "There's more than meets the eye to the sock that comes out of his barrel. ... We got to get him to continue to use all of his weapons and be a complete player, because he's got the tools that it takes to be an impact on the Major League club. Broadway said the lefty-swinging Martin got a bit pull happy with the shorter right-field porch at Peoples Natural Gas Field in Altoona, and that it played tricks on his approach in Indianapolis. Bryan Reynolds, Altoona (88 games): The 23-year-old's first season with the Pirates was marred by hamate surgery, which kept him sidelined from early April to late May. He returned to finish the year with a .302/.381/.438 slash line, seven homers, 46 RBIs and 56 runs scored. Pittsburgh's eighth-ranked prospect got better as the year went along, too, batting .325 with six long balls after the All-Star break. "You rarely see guys come back strong right away from the hamate surgery -- it's usually the next year that they get back to it, just from a strength standpoint," Broadway said. "The quality of the at-bats and the quality for the contact he was making, managing at-bats and doing some damage, he really did a nice job." Broadway also took notice of Reynolds' center field defense, saying he was adept at taking efficient routes and was deceptively good at creating angles to the ball. The 2016 second-rounder, who was acquired in the Andrew McCutchen trade, made three errors and six outfield assists this season. Jared Oliva, Class A Advanced Bradenton (108 games): A seventh-rounder out of the University of Arizona last year, Oliva came on strong in his first full season in the pros, batting .275/.354/.424 with nine homers, four triples, 24 doubles and 47 RBIs. He finished second to Tucker in the organization ranks with 75 runs and 33 stolen bases. "I couldn't be more excited for him," Broadway said. "He played a very good center field, was the leader on the club and kind of did everything offensively." Right-handed starter -- J.T. Brubaker, Indianapolis (22 starts), Altoona (six starts): The 25-year-old was honored by the team as the top Minor League pitcher in the system after compiling a 10-6 record with a 2.81 ERA and 131 punchouts over 28 starts spanning 154 innings. In his fourth professional season, he led the system in ERA and ranked second in strikeouts to top prospect Mitch Keller (135). "I think his execution continued to get better. He's got good stuff and as he went back to Altoona and the transition up to Indy, you just saw the quality of the pitches continue to refine," Broadway said. "The command of his fastball and the usage and the quality location of his slider all continued to improve, and he just did a really nice job transitioning to Triple-A and maintaining that focus and executing pitches." Brubaker allowed nine runs and struck out 35 in 35 innings at Double-A before getting elevated to Indianapolis at the end of May. He made six scoreless appearances, all but one of which came with the Indians, and was very tough on righties at both levels. "He consistently put his team in a position to win every time he took the mound, and his level of improvement from 2017 to 2018 was remarkable," Broadway noted. Left-handed starter -- Brandon Waddell, Indianapolis (19 games, 15 starts), Altoona (nine games, eight starts): A category that would surely go to Hearn had he not be traded to Texas for closer Keone Kela, Waddell pitched his way into contention by eating up more innings than any other Pirates Minor Leaguer, except for Tyler Eppler. The team's No. 24 prospect went 7-9 with a 3.59 ERA and 103 strikeouts over 135 1/3 innings in 28 appearances, 23 starts. "The key for him has been executing his fastball -- when he does that well, he's in a really good spot," Broadway said. "I think he did that well in Altoona. He earned himself a promotion and was efficient and then kind of backed down a little bit in Indy. So we just want to continue to focus on him attacking and forcing weak contact early in counts." Waddell was not added to the 40-man roster by last month's deadline, making him eligible to be selected in next week's Rule 5 Draft. Relief pitcher -- Matt Eckelman, Altoona (23 games), Bradenton (17 games): The 25-year-old pitched to a 5-1 record and a 2.05 ERA with 44 strikeouts in 48 1/3 innings, converting 17 of 20 save opportunities across both levels. He held opposing batters to a .213 average and posted a cumulative WHIP of 1.24. He earned a spot in the Arizona Fall League but had a rough time with Surprise, allowing 16 runs (13 earned) in nine appearances spanning nine innings. "I think he put himself on the map ... he had a nasty split that really paid dividends this year," Broadway said. "He's similar to other guys, when he's ahead of the count with the fastball, he puts you away quickly because his splitter is really hard to hit."